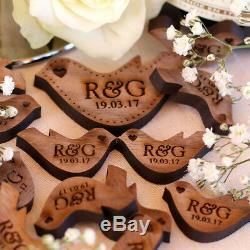 Personalised Wooden Mr & Mrs Love Heart Doves Wedding Table Decorations/Favours/Keepsake. Beautifully designed and personalised for your memorable occasion by NIVI Design. 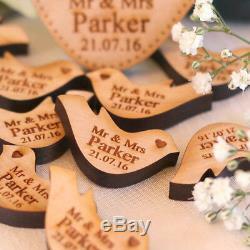 These wooden doves are perfect for your wedding décor adding a touch of vintage charm to your wedding table. 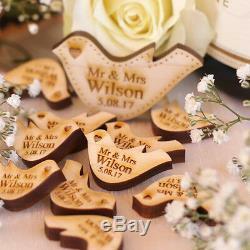 Custom made and personalised to your surname, names or initial with your memorable date. These elegant symbols of love and purity will gracefully adorn your. 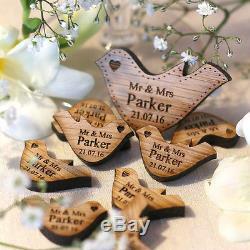 For your guests and treasure the larger love dove as a keepsake to remind you of your special day. 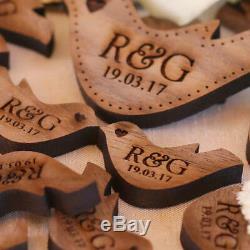 Carefully laser cut using high quality 6mm thick Solid Oak, Maple, Cherry or Walnut You will not find this anywhere! To help you decided which solid hardwood is right for you we listed a brief description of each below. Please note that all the hardwoods are solid timber and being entirely natural may vary to some degree. Oak has a wonderful rustic appearance when laser cut and engraved. It is perhaps the most varied in terms of tone and grain from all our hardwoods. Please be prepared to accept the variation in this product. This of course is part of the charm of oak! The surface although sanded to a smooth finish will still show off the natural broad grain. When laser cut the natural resin in the timber does rise to the surface and is displayed as a darker flared effect around the engraving. The resin can have a slight tackiness upon touch but usually dries off within a couple of days. Recognised for its traditional values oak is being used more and more in a contemporary setting, and certainly remains the classic timber of choice. Maple has a creamy white colour. The timber has a smooth surface showing off a gentle floral figuring. When engraved, the light colour of the timber is contrasted by a rustic flared effect around the engraved area. Maple is very consistent in appearance and is perhaps the hardest of all our timbers. Cherry has a slight reddish brown pink colour to its smooth surface. The floral patterns of its grain make cherry a particularly beautiful timber. This timber engraves consistently and is ideal for detail work. Please note that cherry is a relatively small tree and can contain small knots and other natural markings. Walnut varies in colour from a pale brown to deep chocolaty brown. Currently in vogue with many designers walnut is a premium hardwood made elegant by its beautiful floral patterns. The laser engraved areas appear as a deep dark brown. Walnut would certainly make a stunning accompaniment to any special occasion. 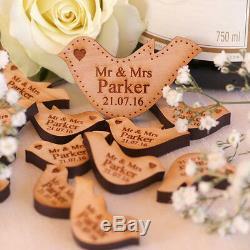 49 Small Love Doves - 3cm wide by 1.8 cm high 1 Large Love Dove 5cm wide by 2.8cm height. If you order the following: 50 Doves. You will receive 49 Small Doves & 1 Large Keepsake Dove 100 Doves: You will receive 98 Small Doves & 2 Large Keepsake Doves 200 Doves: You will receive 196 Small Doves & 4 Large Keepsake Doves 300 Doves: You will receive 294 Small Doves & 6 Large Keepsake Doves. If you order 100 or more, your large keepsake doves will face each other. Mr & Mrs + (SURNAME) + (MEMORABLE DATE). Mr & Mr + (SURNAME) + (MEMORABLE DATE). Mrs & Mrs + (SURNAME) + (MEMORABLE DATE). (NAME & NAME) + (MEMORABLE DATE). (Initial & Initial) + (MEMORABLE DATE). For SURNAME, we will engrave in the format that you have given us. For NAME & NAME, we can only fit first name of each person one above another. We can also engrave initials if you wish e. Maximum date can only be 6 digits e.
The date will be copied in the format you have given, so if you have chosen the month first, it will be engraved in this way. If we are not sure, we will contact you in the first instance to clarify before production. 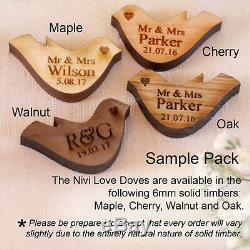 We want your day to be special and unique, our sample pack includes one each of the wood that is available and a variety of engraving styles to help you decide the finishing details. Please note that the samples are NOT personalised. Please dont forget to insert the details as this may cause delays in creating your order and posting. Please note that the above international times are approximate and international deliveries can take longer due. You may have custom charges in your country that you will have to pay. For damaged items, please send us a photo. We want to make your day special and memorable and therefore open to your extraordinary requests. 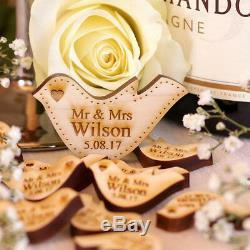 The item "Personalised Wooden Mr & Mrs Love Heart Doves Wedding Table Decoration Favour" is in sale since Tuesday, December 30, 2014. This item is in the category "Home, Furniture & DIY\Wedding Supplies\Centerpieces & Table Decor". The seller is "nividesign" and is located in Loughborough, Leicestershire.